The restoration of the Rappahannock River watershed and Chesapeake Bay requires a wide range of infrastructure and restoration projects designed to reduce pollutants like nitrogen, phosphorus, and sediments from entering our local waterways. These projects are often called best management practices (bmps) and can include: livestock exclusion fencing, bioretention basins, stream restoration, green roofs, riparian buffer planting, urban street trees, and more. Each of these best management practices addresses pollutant concerns in a unique way. Most of the bmps being installed across the Chesapeake Bay watershed require design expertise from a professional engineer, landscape architect, landscape designer, forester, or other contractor. Quite a bit of time, money, and effort goes into planning, designing, and installing these projects which communities and the environment are counting on to achieve pollutant reductions. When designed and installed correctly, these various bmps are a very effective strategy to achieve pollution reduction goals. But what happens 5 years after they are installed? Are they still functioning and removing pollution as designed? Performing routine maintenance is among the most important part of any successful restoration project. This means regularly scheduled check ups, clean outs, and repairs as needed. Routine maintenance will not only ensure a project continues to function as designed, but it will save money down the load by preventing a project from complete failure which could require thousands of dollars to replace or repair. Think of a bmp like your automobile. Every couple months or so you get the oil changed. Every several thousand miles it gets a check up, tires rotated, fluids changed, and more. This is to ensure a long life and to avoid and large costly repairs. The same can be applied to best management practices. Friends of the Rappahannock works with lots of partners to secure funding for bmps, design and install bmps, and perform monitoring and maintenance on installed bmps. 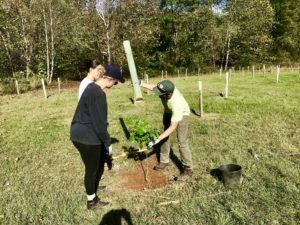 This fall we are working with local students and volunteers to monitor and perform maintenance on a series of forested riparian buffer planting projects we installed this past spring. We are recording total mortality of trees and shrubs planted, identifying problems with tubex tree tubes installed, replacing bird nets, re-scalping turf and weeds encroaching on trees, and working with landowners to replace dead trees when needed and as resources are available. 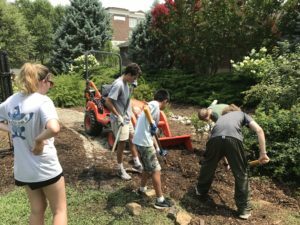 This past week we were fortunate to have two students from the Blue Ridge Virtual Governor’s school join us for a maintenance day at a riparian buffer planting project on the Rapidan River in Orange County, Virginia. 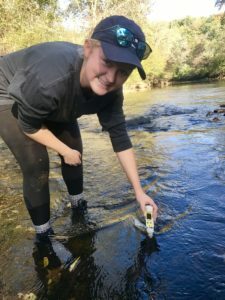 We found only a 10% mortality rate, almost no damage to our tree tubes from weather and wildlife, scalped around all the trees, and even sampled for a myriad of water quality indicators to track improvements as the project matures. 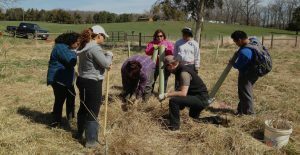 If you have questions about proper maintenance techniques for a restoration project on your property, in your community, or just general questions, please contact Friends of the Rappahannock at 540-373-3448.